Every now and then, we throw in a special episode of DNN Hangout. These special episodes are normally by request of you or another viewer in our audience. This time, we didn’t need to wait for a prompt… With the announcement of the DNN 8 module development contest, we already knew that people would be more than eager to get started… but before you can get started, you probably need a primer on just how to do that. That’s the sole purpose of this hangout. Side Note: If you talk to, meet, or otherwise run into Ian Robinson, please thank him for creating dnndev.me. The little bit of time that everyone in the community saves with this contribution is pretty awesome! WebAPI Series by Filip W.
Tony - [ModuleAction: ] is not from knockout or any other SPA framework - that is a DNN Token used for injecting DNN information into the HTML page. Tokens are processed server side before the HTML is rendered. As far as least common denominator - I would consider Knockout to be that least common denominator. It is a simple lightweight library for two-way databinding that has been included and used in DNN since DNN 6.2 released in 2012. We have several blogs showing you how to use Knockout - http://www.dnnsoftware.com/community-blog/cid/134710/an-introduction-to-knockoutjs-ndash-part-1 The site Knockoutjs.com is a great resource for learning Knockout. I don't know any web developer among the ones I work with who knows Knockout. They are either using jQuery or learning/using Angular because it's becoming very popular. A few use React. So I am not sure I would say Knockout is the least common denominator. Among DNN module developers because it's included in DNN? Maybe. I don't know Knockout and I am not sure I want to learn it. I would go for Angular for the simple self serving reason that, in my area, it seems every web development job is looking for people who know it. But I do believe any technology can be learned if there's a need to. @Tony: All are good options, and with the exception of React, they each allow you to use an MVVM approach to binding to the front end. React is more of a rendering engine and can be used with both Angular and Knockout. I'm personally moving to Angular because it's more of a full solution. Knockout is purely binding, but Angular allows you to do both, and works seamlessly with bootstrap, but in a native and integrated way. I have tried in the past to create a SPA using AngularJS on the 7.x platform. I used my own code to inject razor templates into the module which contained the html/js. It all worked great then I hit a brick wall, namely DNN has a lot of user controls (file picker, WYSIWYG editor etc) that simply don't work outside of a webform and server side code. So fast forward to the DNN 8 CTP6, what I didn't see in the video is how a developer would create a SPA module that has a DNN WYSIWYG edit content editor using just a html page? On a separate note, I have to agree with Tony, AngularJS should be the preferred/recommend framework for DNN SPA modules. AngularJS has a lot more scope for developers, routing, many third party modules (http://ngmodules.org/) and more help/articles. @Mark - We are currently working on building out controls for file picker, wysiwyg provider and others as part of our Dynamic Content Creator work. All of those controls will be available for use in a SPA module. I do understand your point on the SPA framework. It will be interesting to see how the community and module developers create their SPA modules and what libraries are used and if any patterns appear. When do you think native js/html controls will be available for SPA module development? With the competition at the moment I have a number of ideas which would require WYSIWYG. Secondly will the SPA version of the controls be first class controls? I noticed that in the Dynamic Content Viewer that the serverside WYSIWYG on the edit content screen doesn't have the same image selector as a standard module, its missing the "browse server" button to locate images to insert. @Joe - Its good to read that DNN team is making progress with Dynamic Content Create work. I also had a few issues with file pickers and wysiwyg editor for some of the things that we do within DNN 7.3.x. What I ended up doing is a bit of a custom file picker controls and no wysiwyg editors. Can't wait for the long awaited DNN 8. @Joe: Some might say that DNN Corp has already chosen a preferred/recommended framework with KnockoutJS being included as a native framework and used in core features. Keeping that in mind... It might then make sense to have the other most popular options available as registered, core, first class citizens as well to help prevent conflicts between developers. They don't need to be in use in the core, but at least we wouldn't each be doing it a different way and stepping on each others toes. I don't want to turn this discussion into which framework is the best one. I am saying I would prefer I do not see future DNN tutorials dependent on KnockOut. I don't know it and I don't want to spend time learning it. A DNN module developer doesn't need to know it to develop modules. Let the developer choose the framework they are comfortable with the most. @Will I do think you have a point, DNN can't possible have every JS lib but without adding the standard/popular ones for SPA it means each module will attempt to load its own. A bit like what happened before jQuery was bundled with DNN. Also I noticed on the Dynamic Content View when you load the WYSIWYG that its not the same control as used on the standard HTML module for example the image picker is missing the "browse server" feature. Will the html/js version of the WYSIWYG have the "browse server" feature? I guess I'm asking will the html/js version be first class controls within DNN or will they be cut down versions compared to the server implementation? I'm really excited by the changes being made to DNN to allow developers to use MVC and SPA so please don't think I'm being critical. Joe - Thanks for the demo. When do you think the template will be available. You indicated that is was nearly complete. 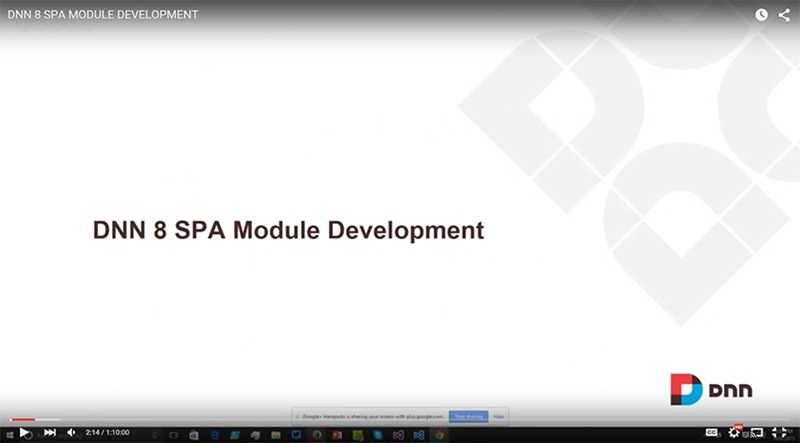 @Joe when do you think the SPA module development pattern will have js/html controls (WYSIWYG) available? Will this be before the end of the DNN8 Module Competition? Also I noticed that the MVC implementation used on the dynamic content viewer, the WYSIWYG editor doesn't appear to have the browse server feature when selecting an an image to use. Will the MVC/SPA versions of the DNN user controls be first class controls and have the same functionality as the webform server side versions? @Tony - I use Knockout in my demos, not because I think it is the best SPA framework, but because it is already widely used in the core platform. I could write my own data-binding code, but it would take a lot more time and make my samples significantly more complex. To me, two-way data-binding is a baseline feature offered by almost all SPA frameworks. As a result, I think Knockout provides a nice simple implementation that shows people the concept without being overly complex. @Mark - We are still working on having a provider implementation for the RichTextEditor for client side use (MVC module, SPA module). I would suggest you use a simple HTML editor approach in your module, like we use in the current DCC implementation. It should be fairly simple to swap this out once we finalize our core platform approach. @Joe is there any news on implementing the RichTextEditor Provider for MVC/SPA modules, I just switched a project from Webforms to MVC and I am actually hesitating as to actually switching to MVC without having wysiwyg and file upload capabilities. I know this is 2 years old, if it is implemented, then I just don't know how to use it in a razor view, could you give me some hints? Thanks.